August 2017 – moafrikafmradio: The Most Authoritative Radio Ever! © Reuters Mothetjoa Metsing (File image) Maseru – Lesotho’s former deputy prime minister Mothetjoa Metsing has reportedly fled the country after receiving death threats. According to SABC, Metsing “feared for his life”. A BBC report said that he had fled to South Africa. Tensions remained high in the mountain kingdom after the killing of Prime Minister Tom Thabane’s estranged wife. Thabane’s estranged wife was shot dead two days before his inauguration in June. The motive behind the shooting still remained unknown. The country’s former defence minister Tseliso Mokhosi was also recently arrested over the killing of a policeman in 2016. The police officer’s body was found earlier this month. The former minister had since been freed, SABC said. Mr Mokhosi was yesterday remanded in custody by Chief Magistrate ‘Matankiso Nthunya. Prison authorities, suspecting that the man had severely beaten by police him took him to a local hospital for medical attention and treatment. He was confirmed to have been brutalised. RK. Lesotho: August 31, 2017—Maseru police this afternoon, dispersed striking students by firing tear gas into the crowd and shooting at them at the same time, injuring a lady student. Students at the Lerotholi Polytechnic had gone to the streets, chanting freedom songs and shouting abuse at government for failing to deposit their monthly stipends into their accounts. The main road passing by the college was barricaded with heavy rocks and burning tyres, private vehicles were burned, stones thrown at other vehicles. After the incident, the police left the shot girl bleeding. She was taken to Queen Elizabeth II Hospital by her fellow protestors. Students of the National University of Lesotho (NUL) began their protest two days ago. In the first day, they alleged threw stones at police and injured a number of them. Today, police overcame them with tear smoke and rifle bullets. College authorities could not be reached for comment. The staff allegedly vacated the school at the very beginning of the riots. The difference between the present regime of Thomas Thabane and the one that was led by Pakalitha Mosisili is that the previous regime’s riot police used water cannons to disperse crowds not tear gas and rifle bullets. RK. Maseru: August 31, 2017—Papali ea karete e hlalosoa e le o mong oa mehlala e metle ea puso e nepahetseng, e leng papali ee le hoja e qetella ka tlholo, ho seng le ka mohla o le mong sebapali se seng se ka qetellang se utloisitsoe bohloko ’meleng joalo ka mefuteng e meng ea papali e kang ho kalla, seqatamajoana le ho betana. Papali ena, e hlalositsoe ke banna ba Basotho e bapaloa ke lihlopha tse peli tse emeloang ke motho a le mong sehlopha ka seng, ’me e bapaloa ka masene le maqiti a maholo. Boemong ba Lesotho, tonakholo, ho fihlela joale, e hlalositsoe e tebabisoa ke “lethula” le Mathibeli Mokhothu, le ileng la e qala nakong ea ha e ne e re mapolesa a tokhotse babelaelloa. Hape, ba re le ntse le tsoelapele ho thula tonakholo tabeng ea moputso oa mokhethoa oa Mahobong le litsiane tsa ho ba motlatsi oa tonakholo ea maoba le maobane. Ho bile ha kenella taba ea Lipeketeng, moo lipotane li reng ha ho lebitla la batho ba bangata ba neng ba patoe ka khofu sebakeng seo sa Hlotse, moo ho neng ho qhalloa mantle a batho, athe MOAFRIKA FM RADIO eona e re, ho felisa leshano le amanang le taba eo, ho etsoe liphuputso tsa borutehi, ho fatoe sebaka seo, e seng e be lentsoe la e mong khahlanong le la e mong feela. Moo lipotane li latolang kapa li etsang khang ka lipolao tsa batho ba se nang molato, Ha koasa le ho chesoa ha matlo a bona, a kenyelletsang a morena oa sebaka seo, ’moho le ho qobella lori ea mohoebi oa moo ho isa litopo Hlotse, MOAFRIKA e re ho thehoe lekhotla le tlang ho ahlola khang eo. RK. Metsing o re o tla ea kena mose ho maoatle a ntse a batlela Lesotho, khotso. Maseru: Thursday, August 31, 2017—Moetellipele oa Nonyana e Kholo o re ha a lula feela palehong, koo a leng teng, empa o ntse a kopana le boetelipele ba linaha tsa Afrika e ka boroa, a li tlalehela bokhopo ba ’muso oa Koloi Alliance, a ba a kopa hore ba romele moifo ho tla ba fupuletsa linnete tsa litaba tsa hae. Empa, o re ha ba ka thulana le bothata linaheng tsa Afrika e ka boroa, ha ba na ho thatafalloa ke ho tsela maoatle ka sepheo sa ho fumanela Lesotho khotso. A bua ho MOAFRIKA FM RADIO qetellong ea Hora ea Litaba ka Labone lena, monna oa Mahobong Ha Lobiane o itse, ha joale, o sa le mong koo a teng, empa o ntse a sebetsa le banna ba habo ba ka Lesotho ka mona, bao a ba lebohang haholo, bona le sechaba sohle sa Basotho se emeng le bona ntoeng ena. O itse pele a tloha hae, o ne a se a ile a bona ka mahlo banna ba mapolesa, ba neng ba roetse likotlolo tsa ntoa, ba neng ba se ba le malala a laotsoe, ba tjametse monyetla oa ho mo qhautsa le ho mo leka. Ho feta moo, o re o ile a bona ka mahlo a hae sekoeta se neng se fihle liofising tsa LCD, Maseru se tsamaea ka koloi e se nang linomoro. Ha a tla tsoa le nku terateng, monna oa ’Mamozwandile o re o ne a se a ile a tseba ka manyela-koaeeng a hae hore eena, khahlanong le monghali Tšeliso Mokhosi, ha a na ho tokhotsoa feela, e hlile o tla romeloa ha mosima ha o tlale, etsoe, lebota la marang rang la matona a toala le itse ke sona see e leng morero le sepheo sa moetellipele oa oona. Mohlomphehi Mohlophisi e Moholo o buile kamor’a puisano eo, a re MOAFRIKA FM RADIO e tla lula e phomoletsa litaba tsa monna eo oa Letebele, e ba e li beha moeeng, a ba a re boemeli ba ’muso, bo tla ba le bolokolohi bo tšoanang ba ho thula kapa ho hlakisa holim’a litaba tseo. RK. Maseru: August 30, 2017—Moetellipele oa Nonyana e Kholo, Monghali Mothejoa Metsing, o tlalehoa a iphile limenyane, maobane bosiu, kamor’a ho chophola lerabeng la batokhotsi bao menyenyetsi e reng ba ne ba le letšolong la ho mo hleka, ho lena la ba utloang. Monghali Lesolle Phakisi, setho se tsebahalang haholo sa Lesotho Congress for Democracy o buile tsena Mafekefekeng a Labobeli la beke ena, a mpa a sa bolele hore na o tsoile ka lefe lekhalo. Mehloli e tsebang litaba, e ba e li phatlalatsa ka marangrang e re Mokhosi o tšoaretsoe hore a tle a qobelloe ka ho tokhotsoa hore o ne a le ’momoring oa ho bolaea Khetheng a e-na le Mothejoa Metsing, Pakalitha Mosisili, Sebonomoea Ramainoane, Serialong Qoo, Mathibeli Mokhothu, Teboho Sekata, Semano Sekatle le ba bang. RK. Maseru: August 30, 2017—Motlatsi oa moetellipele oa Nonyana e kholo o balatsoe qoso ea ho ba ’momoring oa ho bolaea Mokalekale Khetheng a e-na le mapolesa a seng a ntse a emetse nyeoe a le ka chankaneng e kholo ea Lesotho, Maseru. Lekhotla la ’Maseterata e Moholo ’Matankiso Nthunya le neng le phename haholo, ha lea mo botsa hore na o molato kapa che, le mpile le mo balla litokelo tsa hae tse akhang hore o na le tokelo ea ho ipatlela ’muelli oa khetho ea hae le beile e tlang ho mo lumella ho emela nyeoe a le kantle ho chankana. Erekaha lekhotla la ’maseterata le sena matla a ho mamela kopo ea beile, nyeoeng ea polao ea motho ka sehloho, ’muelli oa hae, Monghali Qhalehang Letsika o hlalosoa a se a ntse a ngola lipampiri tse eang ka lekhotleng le phahameng ka sona sepheo sa ho ea mo kopela beile. Monghali Tšeliso Mokhosi o fihlile khotla a tsamaea le mapolesa a mane a neng a sa hlomela ka tsela e bonahalang, sefahleho sa hae se ne se bonahala se topile, a bile a hlotsa. Mrs Nthunya o itse Mokhosi o tla boela a hlaha khotla ka Labone la hosane, a se a tsamaea le bao a qoselletsoang le bona. Mabaka a ho hlaha khotla hoo, ha a hlalosoa. RK. 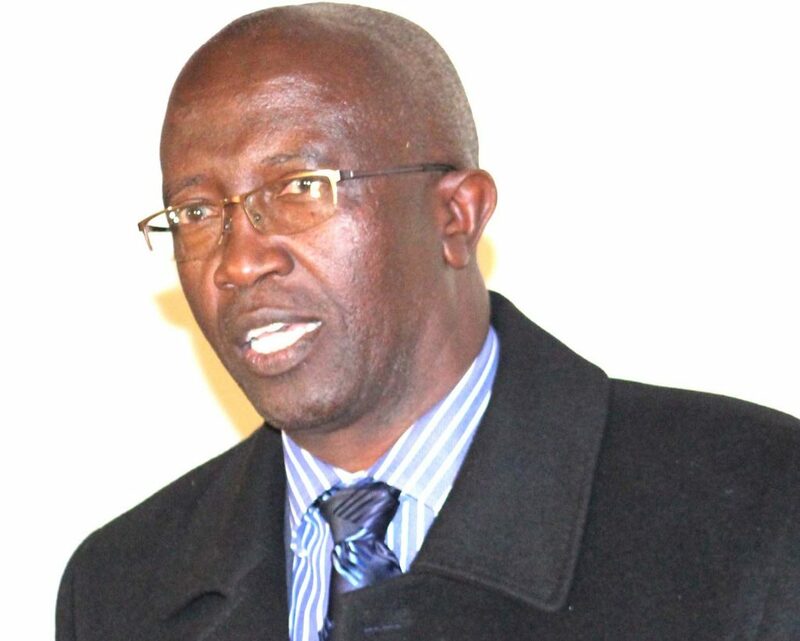 Maseru: Wednesday, August 30, 2017— Tseliso Mokhosi, former minister of defence in Lesotho has been charged with conspiracy to murder the late police constable Mokalekale Khetheng by Chief Magistrate ‘Matankiso Nthunya. He was not asked to plead. Mr Mokhosi was arrested Monday after handing himself to police who had phoned him, telling him to report himself to a team of investigators at the police headquarters in Maseru, over the past weekend. The family of the former minister, alleges that Mokhosi was badly beaten by police while in custody over the past two nights. RK. Maseru: Tuesday, August 29, 2017—Deputy leader of the Lesotho Congress for Democracy (LCD), Mr Ts’eliso Mokhosi was today, Tuesday, seen by a private doctor in the city of Maseru. Police, who were driving a white twin-cab, whisked him away immediately after leaving the surgery. He was limping, his face was bruised; hands were swollen. He seemed to be in extreme pain and distress. He was refused the opportunity to talk to journalists and his party faithfuls. RK. Maseru: Tuesday, August 29, 2017— Former of defence of Lesotho has spent a day and night in police cells at the head quarters of Lesotho police in the capital Maseru. Mr Tseliso Mokhosi is one of the many Basotho suspected of having had a hand in the brutal murder of a junior police officer, Mokalekale Khetheng was summoned to the police head quarters on Sunday, but, on the advice of his lawyer, Qhalehang Letsika a senior attorney in the kingdom, reported himself, Monday morning. It is alleged that the former minister of defence has been denied visitors, even his wife. Also that he has been beaten by his captors. The arrest of Mokhosi follows that of his former driver, one Sele who was arrested Thursday last week and kept in intention at the police head quarters cells till Monday afternoon. He was released without charged. he too had been beaten by police. His attorney is considering a legal action against police for malicious arrest. Prime Minister Thomas Thabane, speaking in parliament recently, instructed police to beat suspects, saying he’ll stand by them. RK. In order to comprehend political consequences of the firing of the President of the Court of Appeal in Lesotho, it is important to understand the constitutionality and politics surrounding Judges Appointments and their removal in a democracy. In this (democratic) system, the rule of law is said to supreme. Since our discussion takes place within the confines of democracy, it is important to outline some critical characteristics of democracy so that it will be clear what we are talking about. But the concept democracy has acquired various meanings to different people. In fact, democracy is quintessentially a contested concept. Democracy is a good word to most countries because is a rule based system. Competitive elections are central to most democratic regimes. Equally important in a democracy is the observance and protection of human rights. These rights are enshrined in national Constitutions. Very few countries in the world today would like to be labeled undemocratic or even illiberal democracies. Since 1993, Lesotho has had more elections than most Southern African Development Community countries (SADC).Basotho have not only excelled in holding competitive elections but they been very successfully in changing their government through elections more than most SADC countries. Of all the current fifteen (15) SADC countries only four (4) of them including Lesotho, have been able to change their governments through democratic elections more than three times. The rest of the other SADC democracies have been governed by one dominant party since their independence. In a democracy, transparent processes are followed and there is full accountability. That process is called good governance. Governments govern by consent and adhere to laws and good democratic principles. In democracy, there is justice and freedoms. In this democratic environment peoples differing opinions are not censored but celebrated. In fact, for James Stewart Millis and Jeremy Bentham, they saw this system as providing the happiness of the greatest number. Since majority of the people are happy in a democracy, this makes the system special because it is the main reason why leaders and people likewise respect and obey laws. Therefore, under this system there is high tolerance for other people’s views. For John Locke, only in democracy are human rights protected. These are rights to liberty, property and life. This therefore, injects Thomas Hobbes conjecture that, only in democracy the state will secure our rights even to unfair employment practices. The state has an obligation to ensure that these fundamental rights are secured. This is tantamount to the common good as argued by Jean-Jacques Rousseau, since it is in the general interest of the society as a whole to respect laws of the community arrived at cooperatively for the collective interest of us all. This approach to political obligation holds that, if the government pursues this common general interest of obeying laws and not particular interest, then we all have an obligation to obey laws. That is, nobody shall be fired without being heard or presenting his side of the story. I have learnt somewhere that lawyers calls this the principle of Audi alterem partem rule. If fact, to fire someone without providing him or her opportunity to be heard is not justice that democracy requires. This brings us to another even more emotive concept while still tracing Nugent dismissal. Basically, justice requires us to give to others what they are due or entitled to. Like democracy, the concept of justice is analogously challenging. There is social and procedural justice. Let’s recall that, politics is about equitable distribution of resource. Politics according to Lawson, it’s about who get what? How? When? And where, in order to provide such resource to arrive at what is justifiable or justice. John Rawls quickly comes to mind to solve this conundrum. He seeks to devise a method for arriving at the principles of justice to which everyone can consent. For him, each person is to have an equal right to the most extensive total system of equal basic liberties contemplated with a similar system of liberty for all. Every person must be granted fair opportunity under similar conditions in any office he or she is occupying. That means the liberty principle must take precedence over the fair opportunity and so on. The question is? Did our government considered all these principles before firing Justice Nugent? For Rawls, any act to an individual must not be inimical to the essential well-being of others. That is, if he was release without being heard, what example would this give to our jurisprudence? It is important to highlight what Judges do. They make decisions on the cases that come before them having regard to the law and the facts. They are powerful law makers in politics more especially the common law. Unlike statute law which is crafted by civil servants and past in Parliament by parliamentarians, Judges have more latitude in creating common law. Because of the power of precedent and judicial review which form a guide for future judgements in similar cases, Judges makes common Law. Since Judges makes law through their decisions, politicians tend to pull the judiciary out of their courts into politics so that they can conduct controversial inquiries. It has been this aspect that has motivated politicians to intervene in courts and tamper with the concept of separation of powers. In effect, governments have been prepared to use courts or the image of judiciary for political purposes in ways that tarnish the judiciary and injure its role in courts. The appointments of people who are unfit to be judges or those who have been impeached are such examples of political erosion of judicial independence. In most democracies there are clear Constitutional processes of appointment and removal of Judges. It is very important for Judiciary to jealously guard their independence and not to acquiesce to any form of abuse. In the United States of America, the President can appoint a Lawyer to be a Judge. But that lawyer has to pass a rigorous test of questioning by the Senate. Most democracies, have both selection-appointment and impeachment process in their Constitutions. What is important to be noted here is that, the process of appointment and removal is entrenched in these Constitutions like the Lesotho Constitution. It is therefore, unheard of whereby a seating Justice can be impeached and thereafter reappointed. The doctrine of judicial independence is therefore not only important but sacrosanct in any democracy. It has become a common knowledge that, former Justice Mosito was impeached and was subsequently replaced by Justice Nugent as the President of the Court of Appeal in Lesotho. The question of Justice Mosito’s impeachment is not the subject of this paper, but the removal of Justice Nugent. We have discussed at length above about importance of following the laws in a democracy and how individuals like Justice Nugent has to be treated by governments under the democratic dispensation. It also a common knowledge that on the 10th August 2017, Justice Nugent wrote a letter to His Majesty and the Prime Minister claiming that his removal from the highest court was unconstitutional. He cited the Legal Notice 62/1017 in the Gazette of 1st August 2017 published by his Majesty on advise of the Prime Minister (PM) Thabane as follows; “it appears to me that the purported removal from office is contrary to Section 124 (3) and (4) of the Constitution of Lesotho and invalid but I donot intend becoming embroiled in any controversy on that issue. To the extent that the notice is invalid…..I find it necessary to add that I am disappointed at the lack of courtesy in failing to inform me in advance of your and his Majesty’s intentions. Had I been informed I would have gladly resigned without the need for my purported removal, which I found extremely insulting”. Clearly, something is very wrong here. This surely cannot happen in a democracy. But before passing judgement, relating to whether the Justice removal was legitimate or illegitimate, it’s important to revisit the above Constitutional section. Section 124 of Lesotho Constitution especially subsection three, discusses at length the appointment and the qualifications of the appointment of a Judge to this Apex court. Nevertheless, Section 4 become more crucial in the whole process regarding the removal of which Judge Nugent referred to above. Section 124 Subsection 4 of the Constitution of Lesotho among others makes it mandatory that “Before tendering advice to the King for the purpose of this subsection, the Prime Minister Shall consult the President if he is available”. It is very clear from the President’s (Justice Nugent) letter that there was no consultation as the constitution mandated. The consequence of this PM’s action is a violation of the Constitution of which he was sworn to protect before the nation on the 16th June 2017 when he took oath of office as Prime Minister. The Attorney General under Section 98 (2), (C) of the Constitution of Lesotho ought to have advised the PM against this violation which is an erosion of law and order. Surely, this should not happen in a democracy where everyone obeys laws and where our liberties are protected. It is in democracy, where, our rights are secured and where we expect to do to others what we expect to be done to us. That is a paramount requirement of justice. Justice demands equality before the law. It is in democracy where, our human rights irrespective of our social standing are protected and not violated because we have equal liberties. This action is not only undemocratic but a direct attack on the independence of Judiciary and a violation of the principle of separation of powers. While Lesotho has seen many elections as discussed above, it would appear that, current political leadership is tittering on the path of illiberal democracy. This is where elected rulers pay little attention to individual rights such as free speech and fair employment practices. It is under this environment where malpractices such as unfair labour practice are rife and opposition to what the rulers do is difficult and people are manipulated through control of state media and the use of state apparatus. In this situation, there is impunity and the courts are not respected. It would appear that something drastic must be done to arrest the country from taking this dangerous political trajectory. The independence of Judiciary is sacrosanct in any democracy, but this does not obtain in an illiberal democracy. The firing of the President of the Court of Appeal and an attempt to appoint an impeached justice is not a good example the country want to portray internationally and domestically. The manner, in which Justice Nugent was treated, was so unfair and therefore, reflected a clear collapse of law and order. He did not get justice, because the PM did not follow the Audi alterem partem rule. Justice involves following the rules, irrespective of the outcome. The constitution in section 124 (4) mandated the PM to consult the president which he (the PM) failed to do. Where there is no justice there is anarchy and erosion of civil liberties. The unilateral dismissal of Justice Nugent, therefore threatens the happiness of the greatest number of Basotho in democracy under the current leadership. If a Judge of the stature of Justice Nugent can be dismissed, without fair hearing, what about a man or a woman on the street? Can we still call Lesotho a democracy where our liberties are Protected and our Judiciary independent? No country in the world today wants to be seen as an illiberal democracy where leaders violate the Constitutions of their countries arbitrary. It is an unfortunate truth that, Lesotho by firing unilaterally Justice Nugent, has demonstrated characteristics on an illiberal democracy. Every democracy must uphold its national Constitution and not violate it as demonstrated by the Prime minister above. Similarly, the Judiciary must be extremely vigilant not to per party to any illegal process that serve to undermine its independence. The consequences of firing Justice Nugent are too ghastly to contemplate in our democracy.